This is the story of the unusually long and interesting career of a small Scottish schooner spent primarily in the southern hemisphere. From the quest to trace her history and construction to the careers of those who owned and sailed in her during her 74-year life, the story is full of vividly-portrayed rogues and heroes – the famous and infamous – as well as ordinary people calmly going about their daily business in tempestuous and difficult times, when grave risks were stoically and courageously accepted as a matter of course. Visionary colonists, whalers, sealers, Maoris, botanists, missionaries, cannibals, convicts, aristocrats, explorers and seamen of many nationalities are linked in this narrative and biographical sketches of key figures are brought to life with detailed information transcribed from logs, crew and passenger lists. As well as a dramatic rescue by the ship’s captain and crew, the schooner’s log covers numerous voyages including whaling to New Zealand and trade with Samoa. Built in Kirkcudbright, Scotland in 1789 she was wrecked in the Chesterfield Islands, Pacific Ocean in 1863. Her incredible rebirth only four months later as the schooner, Hamlet’s Ghost is verified by painstaking and meticulous research into records and logs of the vessels concerned. 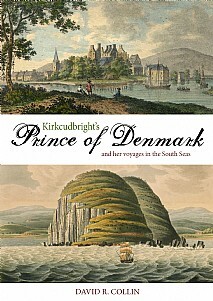 The voyages of the Prince of Denmark and of Hamlet’s Ghost exemplify the courage, skill and vision of men and women who experienced hardship, danger and adversity in their quest for riches in colonial lands. This fascinating story will interest historians, social historians, genealogists and anyone who enjoys an engrossing read.